A large variety of products on today’s pet market can easily confuse any dog owner as to which is the best route to take to keep their canine companion free of those pesky fleas and ticks. There are just as many different options and opinions as there are products as you will find if you ask other pet owners, veterinarians, trainers, pet store employees as well as your friends and neighbors. The method you choose should depend on your dog, your comfort level, and of course your ability to pay for it! Not all dogs can have the same preventative plan, some are held back due to their health and age, others due to their breed! You must make the right choice that fit your dog. The spot on flea and tick preventative is a oily mixture of pesticides and other ingredients that you put on your dog topically. These usually come in pre-measured dosage amounts and you simply break them open and pour it on the withers and down the back of your dog. There are many brands to choose from, but not all are good choices. 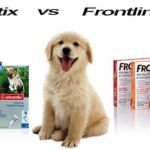 Price does not equal quality, but usually the cheaper the spot on formula the more dangerous it is for your dog! Spot on options have become the most used method, as it is only needed to be applied once a month and is almost always effective in keeping away all biting bugs, including mosquitoes. 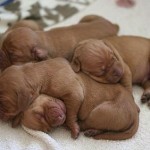 They are readily available for purchase from your veterinarian or some pet supply stores, and vary greatly in price. It is important, however, to recognize the dangers with any product and a spot on preventative is no different! Some dogs are highly sensitive to these toxic pesticides that are used as the active ingredients to repel pests. 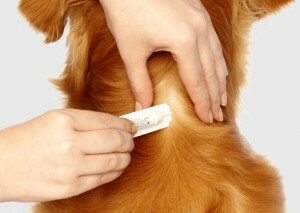 Dogs can develop painful rashes that can easily and quickly lead to danger infections at the point of application on their backs. Some dogs, as the spot on is absorbed through the skin and enters the bloodstream, can have seizures, experience blindness, and even death. Keep in mind, though, that these cases are extreme and tend to happen to sensitive dogs or dogs who have been over dosed with the pesticide. 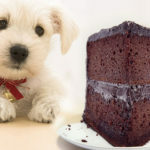 It is important that you know your dog’s weight and find the correct dosage for him. Some brands will have an exaggerated gap in weights for a single does, and if they do, avoid that product! You want your dog’s dosage to be as accurate as possible. When in doubt, go one size down! There are very few edible options on the market today, but those that are there tend to be very effective. These items are typically a meaty flavored pill that a dog will eat up without any issues. Most of these claim to kill all fleas in a matter of hours, and thus far this has not been dis-proven! Most edible options are not monthly, but instead are used only every few months as they are more potent and can be misused easily. Edible preventative options are affordable in comparison to spot on treatments but they do carry their own dangers, such as over dosing if you’re not careful! The term ‘green’ and ‘natural’ have become big hits on all markets in today’s society, and that is no different for flea and tick prevention. With the excessive dangers and increasingly reported cases of sick and dying pets have hit the media involving conventional flea and tick preventatives, natural and proven safe products have become quite trendy. These natural options vary greatly from powdered diatomaceous earth that you sprinkle on your dog, carpet, and outdoors to kill pests to natural herbal essential oils that you can spray your dog with before heading out. There are even essential oil spot on treatments that can be used as a monthly preventative! 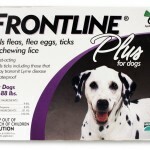 While most of these natural products are extremely effective in areas in which fleas and ticks are not a huge concern, they do have their draw backs. Natural products wear off quickly and easily, most disappear if you dog decides to go swimming or if you get caught in the rain. They need to be applied more often and tend to have a potent odor, though it is usually a pleasant herbal scent. Areas in which it is mostly wooded and very humid, though, usually need something more than just natural preventatives and must use a more powerful pesticide. Whichever method you decide to use, your dog must be protected against the dangerous pests that can cause lyme disease, heartworm and even anemia. An ounce of prevention really is worth a pound of cure in this case, as once your dog is infested with parasites it is extremely difficult to bring him relief. Choose the option that best fits your lifestyle, wallet, and dog’s sensitivity. Remember that most herding breeds are susceptible to carrying the MDR1 gene that makes nearly all conventional preventatives deadly, and they must have other options! 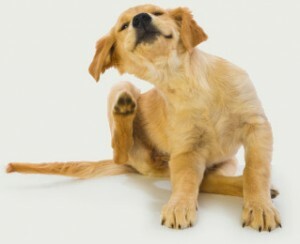 Do what is best for your pet, and you will have a lifetime of flea free comfort!